Joseph Rescigno conducting the Milwaukee Symphony Orchestra for the Florentine Opera Company, Milwaukee, Wisconsin, in the world premiere production, October 2011. Click for the production’s press release. And here are Maestro Rescigno’s comments. 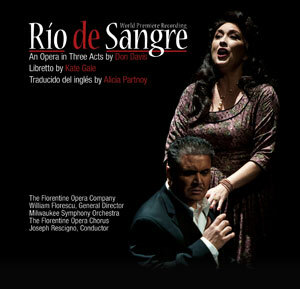 The complete recording of Río de Sangre on two CDs is available from Albany Records USA (item TROY1296-97). The work is ©2010 by Dondavis Music, Inc. Reproduced here with permission. Audio, 1 min. 45 sec. Monseñor, estoy solo con la muerte. Elia duerme en la cama de mis hijos. Mi hija y mi hijo están muertos. Bishop, I am alone with death. He sleeps in the bed of my children. My daughter and son are dead. ¡Ay Miguel! tú a quién llevé en mis hombros. Oh, my Miguel! you whom I carried on my shoulders. when you were small I could hold you in my two hands like an egg. resonando por mis hijos que no supe proteger. for my children whom I failed to protect. están haciendo girar las ruedas de la historia. The drumming is closer. It is in my house. It is turning the wheel of history. La muerte viene a buscarme. Death comes for me. riodesangre.com and Dondavis Music, Inc.
Click here for press releases for the premiere and for the recording is here. For Maestro Rescignos thoughts on the work, click here.